So Duane Reade has come to Bedford Avenue and everyone is up in arms. Supporters like Shari Lind (if she exists) think that we need more Duane Reades, Dunkin’ Donuts and other chain stores, all in the name of convenience. Opponents like Tracy Kinney think Williamsburgers should shop locally, fight the greed and enjoy the music. Personally, I like local shops and will probably do most of my shopping at Kings (which, by the way is also a Manhattan transplant) or Northside Pharmacy (the only true local). 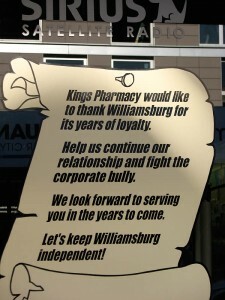 I won’t be “boycotting” Duane Reade, and I do hope the competition forces Kings to lower some of their more outrageous pricing. But in terms of convenience and economy, is anyone else more bothered by the fact that we now have three large chain drug stores but still no supermarkets in Williamsburg? (Sorry, Tops doesn’t rise to the level of super.) Our fresh food needs are served by chain pharmacies, local bodegas and the overpriced chain of Khim’s Millenium stores (new location opening at South 2nd and Bedford!!). For a neighborhood that supports a bustling farmers’ market and at least three CSAs, this is insane. No wonder so many people schlep bags of groceries on the L train. Don’t expect a real food market anytime soon – there really isn’t any place to put one. The Domino project is the only development site with the square footage for a proper (in industry terms) supermarket, but that won’t be completed until 2013 at the earliest (and will still be a car ride away for most neighborhood residents). This wouldn’t be the end of the world if there were local food shops to fill in the void – green grocers, butchers, bakers and the like. But the two local butchers have sold out to the lure of rising rents, and most of the new alternatives (as good as they are) are unaffordable to many long-time neighborhood residents.